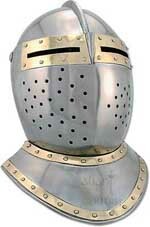 The Bascinet type helmets were used in early 14th Century. The bascinet was a replacement of the great helm. The bascinet featured a smaller and lighter head-piece, which was somewhat globular in form, but was raised a little above the head, and terminated above in a point. The bascinet, while always conforming to the general characteristics of its proper type, admitted many modifications in its form and contour. As it decidedly differed from the great helm, in being only a true head-piece without descending over the head and resting on the shoulders, notwithstanding the circumstance that it was often made in such a prolonged shape at the back and sides as to cover the neck of the wearer, the bascinet was considered to be incomplete without having appended to it and depending from it, a chainmail defense for the neck and shoulders, called camail. This is the lower part of a chainmail coif, a hood or a tippet of chainmail, which was fixed to the bascinet, and hung gracefully over the shoulders, covering the upper part of the body armor, but leaving the face bare. The defensive action of the bascinet was compelled by the further addition of an efficient protection for the face, which was accomplished by means of a piece that would completely close-in the open front of the bascinet itself. This piece, called mesail, or mursail (from the kind of resemblance it necessarily bore to the muzzle of an animal), but more generally known in England as the ventaile or visor, was mounted for both better sight and breathing, and was adjusted in such manner that it could be altogether removed, at the pleasure of the wearer; and, as a matter of course, this visor was not lowered and secured in front of the face except when the combat was imminent. In England the bascinet helmet was constantly worn with camail, but without any ventaile; and in this case the great helm was retained and in action was worn over the bascinet and was resting on shoulders. In England the camailed bascinet helmet ceased to be worn at the beginning of the 15th century, but the bascinet itself continued in use, having, in place of the camail a gorget of steel plate, encircling and protecting the throat.